‘Fruit large, of an oblong figure, about four inches long, and three inches in diameter, tapering to the stalk. Eye small, with a converging calyx, placed in a shallow depression. Stalk three quarters of an inch long, rather stout, and thickening obliquely into the fruit. Skin greenish yellow, appearing through a covering of thin russet, coloured more or less with brown or red on the sunny side. Flesh white, with some greenish veins through it, melting, buttery, juicy, rich and excellent. Ripe in October, and will keep good only a few weeks.’ [George Lindley – Orchard Guide p.367/1831]. 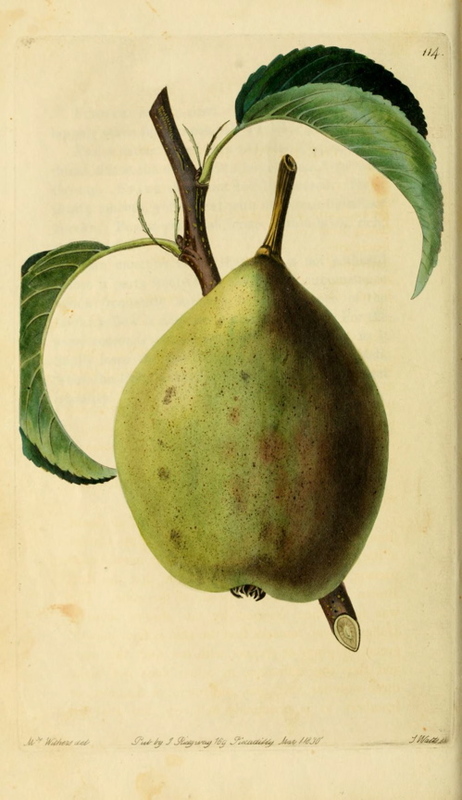 ‘There is no Pear, either of autumn or winter, better than this, which, if it were sufficiently hardy to bear as a standard, would be the most valuable variety of its season; but it is absolutely necessary to give it a wall, and if possible a south one: it bears, well, however, and acquires good flavour on a west aspect. Its period of ripening is October, after the end of which month it will hardly keep. Mr. Thompson has determined beyond all doubt, from the examination of various trees in the Garden of the Horticultural Society, and from a careful comparison of the descriptions of authors, that the Red, Brown, and Golden Beurrés are all the same. This was long since asserted by the always accurate Duhamel, who remarks that the skin is fine, smooth, green, or gray, or frappée with red next the sun; and that this difference in colour does not make three varieties, vert, gris, and rouge, or Amboise, or Isambert, as is commonly believed; but that all colour varies according to soil, aspect, culture, stock, &c.’ [PM t.114/1830]. The large number of synonyms suggests an ancient pear and it is considered to be a very old French pear, cultivated in England since at least 1665. ‘A very old French pear mentioned by Olivier de Serres, 1651; C. Mallet, 1652; Claude St. Etienne, 1670; and Merlet, 1690. It was mentioned by Rea in 1655 as being cultivated in England under the name of Boeure de Roy.’ [Pears of New York p.296]. Amboise is in west-central France, Ambleuse in Belgium and Anjou in north-west France, providing no clues to its exact origins. ‘Beurre Brown: colour brown, tinged with dashes of red; form obovate; size large; quality first rate, but varying much according to soil and situation. In use in March and April.’ [NHM vol.1 p79/1864]. Also figured in Pomonia Brittanica [PB pl.LXXXII/1812]. Listed in all published catalogues [Pear no.3/1843]. ‘Golden Beurré, Brown Beurré, Beurré Bosc ? [the query is Macarthur’s]. March-June. Of excellent quality, of sharper flavour than nos. 2 & 6 but hardly inferior [word undeciphered] of imperfection. For several years affected [word undeciphered] by disease of young shoots, leaves and fruit in form of brown and black spots like [2 words undeciphered].’ [Diary B, MP A2951/1862]. Macarthur is clearly uncertain about the correct identity of this pear. ‘Golden Beurré’ and ‘Brown Beurré’ are generally considered to be the same pear and are treated as such here, although ‘Brown Beurré’ is given a separate entry in the Hortus for convenience. ‘Beurré Bosc’, a different pear, also has its own entry in the Hortus.